The Angels under Mike Scioscia have succeeded for years by eschewing the walk and swinging the bat. But now that defenses are increasingly moved to where the ball is hit, the Angels ought to change their approach. In a move widely viewed as a power play against Scioscia, general manager Jerry Dipoto fired hitting coach Mickey Hatcher this week. Fired Angels hitting coach Mickey Hatcher (Dave Dorman, licensed under the Creative Commons Attribution-Share Alike 2.0 Generic license. http://flickr.com/photos/37744772@N06/5513887600 ). The book and the movie, even the term itself, Moneyball, is about the 2002 Oakland Athletics, compelled to athletic glory by the insights of a front office that loaded up on an under-valued skill (reaching base by walk) and won the American League West for pennies on the dollar. 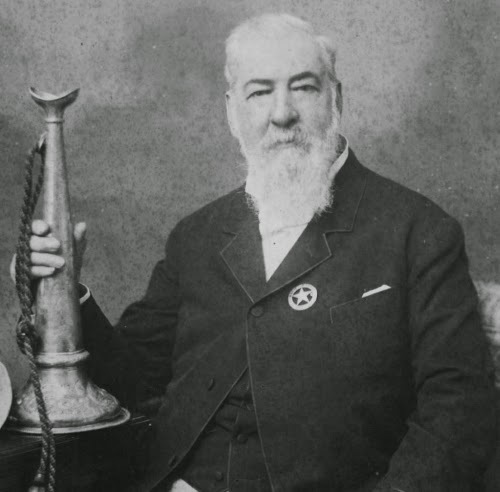 Well down the road and a lot closer to Hollywood, we witnessed a Disneyland response to the realities of baseball at the turn of the century. Under manager Mike Scioscia, the Angels took advantage of a sadder truth: a lot of players were in the game to crush the ball, and not to catch it. Some of these guys might hit the ball as hard with their gloves as with their bats. Teams could be beaten by putting pressure on their defenses. So, don't slow the game down by walking and striking out. Speed the game up by making contact. Why not put the ball in play, run like mad, make the other team catch it and throw it, mix in a home run and see what happens? Mikeyball came of age in 2002, but that team is not immortalized by a book or a movie. That team is immortalized by the 2002 World Championship. Mikeyball didn't just peak higher than Moneyball, but it also lasted long after wealthier teams caught onto Oakland's insight. Mikeyball was winning divisions in Anaheim all the way through 2009. Now, Mikeyball is spent. Mikeyball is dying because the game is changing. The steroid police have kept the ball in the park. Now, teams are relying more and more on defense, using ever more precise data to position their players right where the ball is most likely to be hit. We see more infield shifting and infielders moving around all over baseball, particularly the American League. If you’re basing an offense entirely on putting the ball in play, like the Angels, then you’re playing into the hands of the defense, which is already waiting for the ball. In today's baseball, the batted ball not only is more likely to stay in the park, but the ball that stays in the park is more likely to be fielded. Teams that can't hit through the infield need to put people on base to make defenses play it straight. Thus, the Angels, given their general disdain about walking, are at a disadvantage. Their on-base percentage, .302, is 12th in the American League. They have walked 93 times, fewest in the AL. They are 17-22 as they begin inter-league play Friday night in San Diego. The Angels need to diversify their palette for starting the offense. Tuesday, Angels general manager Jerry Dipoto fired batting coach Mickey Hatcher. 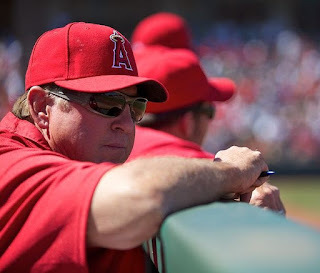 The move was widely perceived as a power play by Dipoto against Scioscia, who hand-picked Hatcher as his batting coach in 2000 and has kept him there ever since. Whether it really means the Angels are changing their hitting philosophy remains to be seen. The new hitting coach, Jim Eppard, has been in the organization for long enough to tutor every homegrown player on the big league roster. Doesn't sound like much of a change, although player quotes saying Eppard is attuned to the mental side of hitting are promising. The one constant about the Scioscia/Hatcher Angels, from the start, is that they put the bat on the ball more than anyone. Every year from 2001 forward, the Angels have drawn less than the league average in walks, and they also have struck out less than the league average each of those years. Some years, they are at the bottom in one or both categories. Their game was to make the fielders work. But now that everyone is applying ever more detailed probabilistic knowledge of where batters are going to hit the ball, much of the work has been done in the scouting report. It stands to reason that if fielders are positioned where hitters are most likely to hit the ball, then the ball is more likely to be hit to a fielder. In 2009, the last time the Angels had a good offensive team, their batting average on balls hit in play was .322, best in the league, which averaged .300. In 2010, the Angels fell to .281, 13th in a league that averaged .295. In 2011, the Angels came up slightly to .288 and the league averaged .294. This year, the Angels are averaging .290 and the league averages .287. In three years since they won the AL West in 2009, the Angels have declined from the top of the league to a league average team at finding holes with batted balls. Notice, also, that the league-wide batting average on balls hit in play has declined quickly. In 2006 and 2007, it was .305. But it dropped to .302 in 2008, then to .300 to .295 to .294 to .287 today. Almost 20 points down in the last five years. For the Angels, it has declined even faster, down more than 30 points in three years. The numbers correlate with increased infield shifting since 2006, when Joe Maddon left Scioscia’s side as the Angels’ bench coach and began sliding infielders around as the manager of the Tampa Bay Rays. Now, he's shifting against right-handed hitters. Increasingly, we see second basemen making snags on both sides of the outfield. If you know the right-handed hitter will pull the ball on the ground because he wants to hit home runs, then move your infielders around to the left. If you can make him hit the top of the ball, he's an out. You can imagine how a general shift in defensive strategy might affect a team as right-handed hitting as the Angels. Teams that shift are happy to pitch to contact. Maddon is something of a national sensation this year, loading one side of infield about three times per game. The Rays, the New York Yankees, Kansas City, Milwaukee and Baltimore all are paced to shift more than 300 times this year, according to Sports Illustrated. Last year, the Rays led everyone by shifting 216 times. This year, according to SI, the Rays already had shifted 126 times by early May. We're also seeing a lot of infield hits throughout the game on plays for which the fielders are positioned just well enough to reach the ball, but not well enough to make a throw. The net result might be the same as if the ball scooted through a normally positioned infield, but it changes the game qualitatively for a team that likes to run and hit, like the Angels. To make Mikeyball work and really wheel those runners from first to third, you need those hard hit ground balls that rocket through the infield. The runner on first is forced to run, so he's off. The ball gets to the outfielder more slowly than a line drive, so the runner is thinking third base. But now, with infielders placed where they can at least keep the ball in the infield, many of those hard hit ground balls aren't going through to the outfield, and the first-to-third running game is all but taken away. The only way to make defenses play more honestly is by putting people on base. That way, defenses can't load up on the hitter. For that matter, pitchers can’t load up so much on the hitter, either. We love that the game is about swinging the bat -- until it isn't. There is a way to reach base without swinging the bat, and that’s by not swinging the bat. The Angels need to be a lot better at it. There seems to be a difference of opinion among the Angels brass about the virtue of plate discipline. Dipoto seems to believe plate discipline is good because it leads to walks, while Scioscia believes plate discipline is best when it leads to a good pitch to hit. Scioscia's way, with notable qualifications, has worked well. However, it's easy to see why it might no longer work as well when opponents are positioning themselves more specifically than ever. Given what Dipoto has said about wanting to improve the Angels’ on-base percentage, they’re not walking enough for his taste. Truth be told, they're probably not walking enough for Scioscia's taste, either. They don't walk enough, period. Walking less than the league average every year says something about the Angels' general approach. But being dead last in the league certainly isn't part of the plan. The Angels' better clubs usually have approached the league average in walks, and those same teams often were near the bottom in strikeouts. An interesting comparison might be made with the 2004 Angels, who finished last in walks. That team also finished first in batting average (.282), second in batting average on balls hit in play (.312) and last in strikeouts (942). That team won the American League West at 92-70. This year's Angels who are last in walks are on pace to strike out nearly 1,100 times and are basically a league average team in batting average (.252) and batting average on balls hit in play. They simply don't hit enough to walk as little as they do. In the past, the Angels would bring veteran players to their team, and if the culture favored contact hitting, the veterans still stuck to the approach that made them valuable. Bobby Abreu came to the Angels at 35 in 2009 and showed a little decline in his walking prowess, but he still took about 90 per year for a couple years. If anything, Torii Hunter has become a little more inclined to walk since joining the Angels at 32 in 2008. Even free-swinging Vladimir Guerrero was willing to accept a walk every couple of days. But these last couple veterans to join the Angels have picked up the local customs since arriving. During his career with Toronto, Vernon Wells would strike out eight or nine times for every five times he walked. He would come in with well less than two strikeouts for every walk. Since joining the Angels, Wells has walked 25 times and struck out 103 times -- more than four strikeouts for every walk. Before coming to the Angels, Albert Pujols was known for his plate discipline. He would walk 100 times in a year and strike out 60 times. Pujols began to lose that edge last season, and now, with the Angels, he has only seven walks and 20 strikeouts. He's not forcing pitchers to throw strikes even when it might be worth a free pass. During his career, Pujols had a .664 on-base percentage on three-ball counts. Out of 1,938 plate appearances running to three-ball counts, Pujols has walked 981 times -- more than half. This year, though, Pujols has 31 plate appearances reaching three-ball counts, and he has walked seven times. His on-base percentage with three-ball counts is .387. The Angels certainly could use an adjustment in their approach to hitting. Perhaps a new batting coach will have some magic words. But the Angels also need to do a much better job upstairs at batter acquisition. They could do with some pure left-handed hitting, of which they did have not one instance on their active roster until they just now brought in Ryan Langerhans, a career .226 hitter. Their only hitter who is any kind of threat from the left-handed box is switch hitter Kendrys Morales. The other switch hitters on the club are equally punchless from either side of the plate. The Angels batting order today is an endless procession of right-handed power hitters who strike out and switch-hitting middle infielder with no pop. The Angels' problems don't end there. For example, there's no one around who resembles Troy Percival or Frankie Rodriguez in that bullpen. But the Angels do have players around who should hit -- or walk. Maybe Jim Eppard can talk them into it. Labels: Jerry DiPoto, Jim Eppard, Joe Maddon, Los Angeles Angels, Mickey Hatcher, Mike Scioscia, Oakland Athletics, Tampa Bay Rays, Vladimir Guerrero.